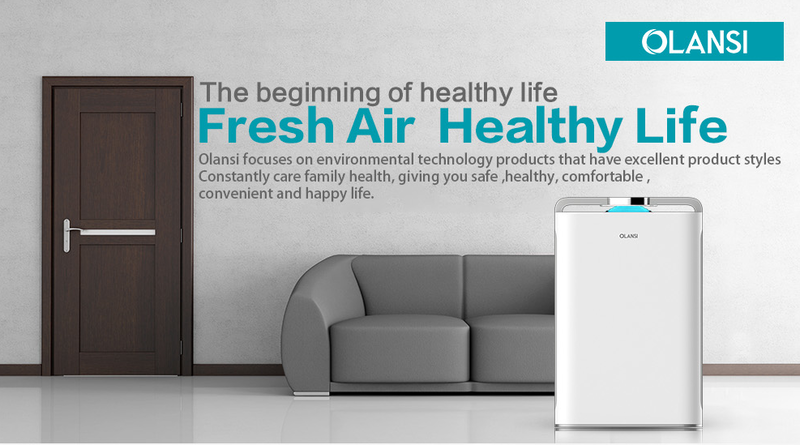 Guangzhou Olansi Healthcare Co., Ltd is a professional china air purifier manufacturer for indoor air purifier. Indoor air pollution is a serious problem.Olansi Tell you why it benefits to install an air purifier in home for your family healthy. Air purifiers rely on a series of filters to help remove negative airborne particles from the air. Once the air is purified it is circulated back into the room. Most purifiers have the ability to complete the cleansing process at least twice per hour to ensure the living area is kept fresh and healthy at all times. The process of repeatedly cycling the air in the room helps to remove up to 99% of airborne particles, such as bacteria, pollen, mold spores and dust. They come in many different sizes and include a wide range of useful features, such as energy-saving setting, multiple speeds and oscillating action. According to the Environmental Protection Agency (EPA) the air in the home has the potential to be between 5 to 100 times dirtier that the air outside the home. Dust is something that will impact any home and will soon start to accumulate if a regular cleaning and dusting schedule isn’t in place. Air purifiers are a practical solution to capture the dust before is able to settle. This is certain to mean there is a lot less cleaning to be done. So, installing one of these purifiers in the home will guarantee the family is able to breathe the cleaner air. Any home with the open plan kitchen will soon notice the odor when strong-smelling food or ingredients are being cooked. Air purifiers are also useful for removing the unpleasant smells from the local environment. Smoke is a further unpleasant smell that is common in the home. Whether this relates to an open fireplace or a family member who smokes, the purifier is a useful option to remove the particulars in the air before it has time to land on the upholstery or carpets. Cats and dogs can release several allergens into the air such as fur and pet dander, as well as causing smells. Air purifiers can be very effective at capturing the allergens in the air that have been released by pets. The regular use of the air purifiers can help stop or slow the spread of germs and sickness in the home. The most effective units include the HEPA filters and UV bulbs to neutralize and capture up to 99.97% of germs that are floating around in the air. Discover more about the positives of using the ionizer air purifier. Established in 2009, located in Guangzhou City in South China, Guangzhou Olansi Healthcare Co., Ltd is a professional air purifier manufacturer. The products of the company contain mini air purifier, home air purifier, HEPA air purifier, ionizer air purifier, car air purifier, room air purifier and so on. All OEM air purifiers are manufactured in accordance with the CE, ROSH, and CB Certification.